For inserting coins or tokens as deposit, which are returned after the use of the locker. For inserting coins or tokens which are either returned or automatically retained by the lock. Operating costs are reduced: No need for the usual labour-intensive issuing/returning of keys due to self-service. 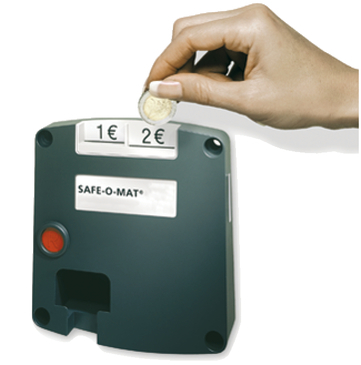 The SAFE‐O‐MAT® locks are equipped with two coin slots for different coins. This removes the need for the operator or the guest to change coins. The continuous cylinder channel allows foreign objects and snapped-off keys that cannot be removed from the front to be pushed through the cylinder. These can be pushed through the rear using the master key and then a piece of wire. The combined coin return/coin retain lock allows one of the inserted coins to be returned as a deposit after the use of the locker and the second coin to be retained as payment. The user can open the locker at any time free of charge during use. The deposit coin is returned whenever the locker is opened. With locker systems that are frequently used by the same group of people (e.g. in schools or universities), users may block lockers unnecessarily by inserting deposit coins, removing the key and this way reserve "their" locker beyond the stipulated locker system opening times. 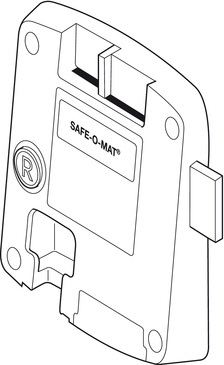 This is where the SAFE-O-MAT® fine key comes in. This key allows a "blocked" locker to be opened, the deposited coin to be removed as a fine and the locker re-locked without the deposit. When the user opens the locker again the key is trapped immediately in the usual way, but the deposit is not returned. This makes locker reservations expensive – and therefore unattractive. Conventional systems have an overriding master key that can open all locker locks. A service key is usually also required so that the cylinder can be changed if keys have been lost. However, "concealed" theft is still possible with any of these keys. Even personnel can be wrongly suspected if the user falsely reports a theft. SAFE‐O‐MAT® solves these problems by using the overriding Promax override key. Personnel can open any locker with this key in the event of an emergency and help the guest immediately. The patented Promax function allows any master key use to be monitored. The user is protected against "concealed" theft since the locker cannot be secretly opened and locked again without detection. Proof to the contrary can be provided if false accusations are made against personnel. Continuous monitoring reduces the operator's liability risk considerably. 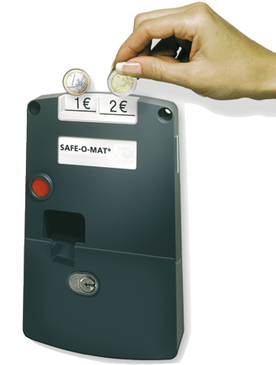 The keys for the SAFE-O-MAT® locker locks are prepared for accommodating number plates that are clipped into them. Complicated manual embossing and attaching individual numbers is not needed. The number plates are available from stock in sets of 50 in numeric order. Wear-resistant laser marking makes the number plates extremely easy to read. The cylinders can be installed and commissioned irrespective of the locker number.